One thing that comes to my mind is what is a reasonable rate of return for myself in my lifetime. What can I accomplish in America having started from nothing? From 1928 before the crash of 1929 to 2017 the average return of the S&P500 is 10%. This period includes many many recessions and crashes. Even subtracting inflation from this the compounding is huge. For reference a $1000 compounding at 10% from 1928 to 2017 will be $4.8MM. In comparison to this 10%, my portfolio has generated dividend income growth at roughly 12% annually since I started in 2014. Note this 12% is from companies raising their dividend and then me reinvesting that dividend back into the stocks that paid them (it does not include income growth from my cash contributions). Stock prices have followed similarly with the dividend hikes. For all intents and purposes I tried 8% growth and graphed the results using the balance of assets I have today of $580,000. I tried three graphs, each differing by how long I continue working in the technology industry. Note: these data are applicable only to my situation and income and savings rate characteristics. Everybody saves and earns at different rates. Different investors will need to analyze their own contribution rates as every investor has different life circumstances. These are idealistic scenarios that average out market noise and does not include any catastrophic disasters like me getting a heart attack. I always want to know how my time is best utilized. From this result I can visualize when it is likely a good time to stop working for someone else and either retire or work for myself. The GREEN line shows what happens if I no longer contribute any money to the portfolio anymore. And the ORANGE and GRAY show what happens if I work 10 more years and if I work 20 more years. From the graph it appears to me that dropping everything at my present age of 28 and choosing to not work and not contribute anymore is a bad idea. 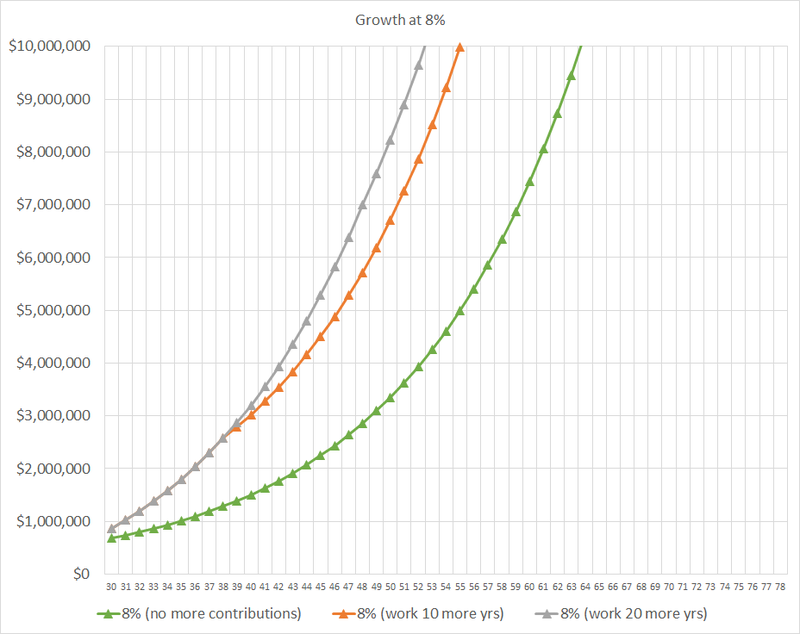 The delta between the green and orange is huge, showing the cash contributions from working age 28-38 is indeed very powerful. From the graph it appears smart to continue working until I am 38. Note this GREEN graph is purely showing growth of the portfolio. If I were to leave work now the real GREEN graph will be less as I will need some money from the dividends for basic living costs. But after 38, it starts to become questionable whether working and contributing those salary monies is as productive a use of my time as the period when I am 28-38. 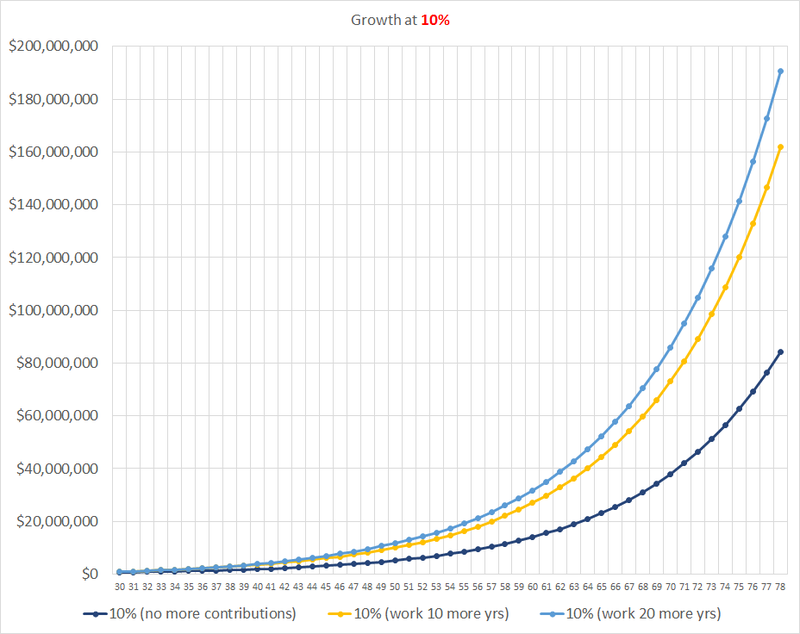 If I worked from 38 to 48 and contributed to my portfolio using the salary, then I will only have progressed further by 22% compared to discontinuing work and discontinuing any contributions to the portfolio after 38. At 48 years of age, I really don't think I would care if I had $7MM verses $5.7MM. Both to me are appreciable sizes of money and the additional $1.3MM isn't worth the 20,800 hours put into an employer. Unless my salary can grow larger (highly unlikely) or I absolutely love the vocation I am in, I likely will see myself pursuing self interests or working for myself after my 38th birthday. Now of course if I have a lot of children or other burden expenses it may make sense to work on something I enjoy and fund those living costs fully and not have to fund the portfolio any further. Another thing to note in the graph above is that each progressive million gets easier and easier as time moves forward. I think I can hit $1MM sometime when I am 31 barring any random insane crashes or run ups. This would of taken me nearly a decade to accumulate that much money. If the growth continues, my second million would be in 5 years. Then 4 years. Then 3 (if I stop working may be a few more months). Then 3. Then 2... Eventually the ball gets rolling on its own. For reference, at $10,000,000 the assets at 2.8% yield will be spitting out $280,000 in dividends. More than what a regular professional can make. What gets really interesting is what happens really really really far out. Not the next few years but the next few decades when I become an old curmudgeon. With 8%, I am looking at decamillion type of growth. 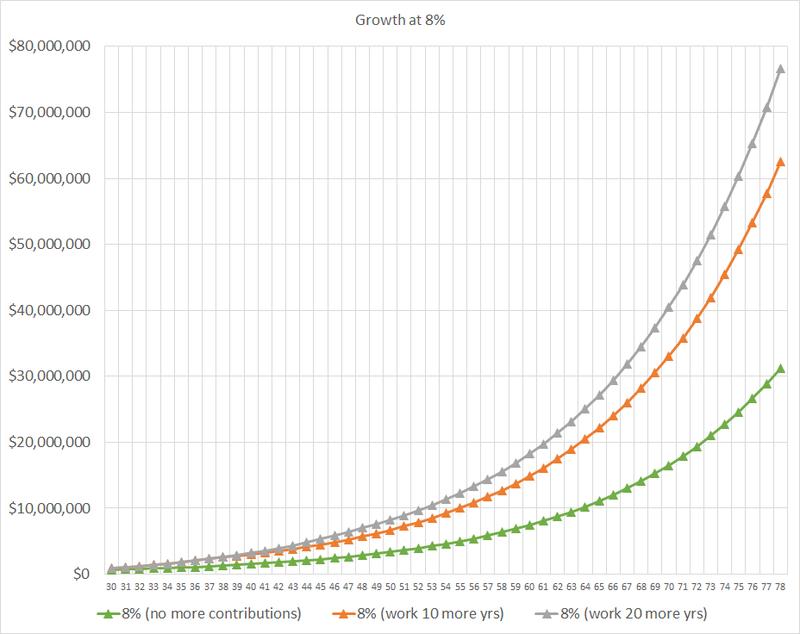 From the graph it makes a lot of sense to continue working from my ages of 28-38 (delta between GREEN and ORANGE). But from 38-48 it doesn't really make much of a difference working or not (ORANGE vs GRAY). Needless to say, even if I stop funding my portfolio all together and take it easy from now on, the returns from the GREEN graph are still appreciable. Regardless if the returns are 10% or 8% or 6%, the results are all extremely impressive. It just shows the awesome power of time. In the beginning years the returns are very slow. It is like watching paint dry. The returns are heavily boosted if one were to work and deploy capital from salary. But over time the contributions from salary become negligible compared to portfolio returns. It is during this time one may consider another vocation or use of his time. Growth in the early days are like a straight line. Over time (a long time), the growth starts to show a curve upward. The reason why most people do not have such returns as these is due to the persistence and time factor. People simply cannot wait decades for their returns. Let alone 3 or 5 years. Those that have the patience and are stubbornly persistent will only be able to take advantage of this (it's not for everyone).